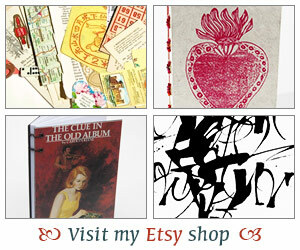 I promised to tell you more about my latest bookbinding adventure so here we go. 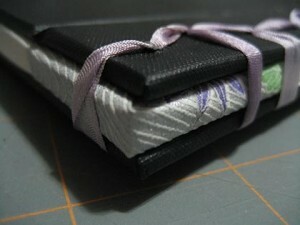 The book I made in the workshop is a variation of a stab bound book with hard covers. As you can see I didn’t quite finish the binding. Why? Well as we were getting closer to the end the instructor realized she hadn’t cut enough ribbon. I didn’t have time to start all over so I left it as is.The binding is not hard to do at all but you do have to concentrate just so you make sure you are going through the right punches and so your binding design will come out right. The book covers are a mix of cloth and paper, which I do love seeing those two together. If you’ll notice though there is paper peeking through the end. Not a good thing. Our book covers were pre-cut for class and those were cut a bit on the small size. Thank goodness I never give away my first books as those are always my learning books. I can feel free to make mistakes on them as long as I get the binding technique right. This is about as far as the book will open. 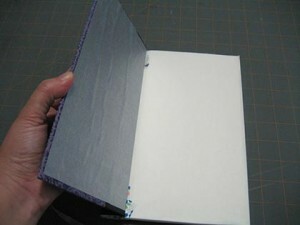 For some books this is ok but for journaling books I prefer to have books that can lie flat when open. You can also probably see some bubbling on the silver end paper. I noticed as I was trying to smooth out the paper that it was staining my bone folder with a dark mark and I stopped. I wasn’t sure if it would then transfer the dark smudge to other paper I was trying to smooth out. Luckily it’s ok. Good thing because that’s my first bone folder since I started bookbinding about nine years ago and I’d love to hang on to it for many more years. I think my favorite part about this book though was making a corner piece for the pages. With some decorative paper we wrapped the ends of the book that were going to go against the binding. There’s no real need for this part but I like that it offers a little glimpse of color and design to the pages. 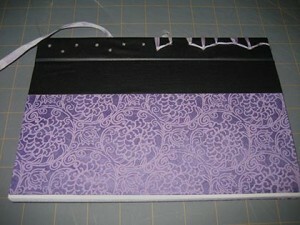 So that’s the latest in my bookbinding adventures. I’ve been finding working in my studio a couple of weekends and it is so much fun to be able to stock up my shop a bit more and just spend time doing something I really enjoy. I look forward to more bookbinding adventures. I like the corner piece and the pretty binding design, but must admit it would drive me nuts not to be able to open the journal the whole way. That’s ok for notebooks, for like listing, but anything else and you need books to fall all the way open. Love the purple paper and the ribbon! Your books are always so beautiful. If I were to give it a try they’d be a big mess! I love that you continue to make books and journals…always experimenting, always learning! I can’t imagine creating an actual book, so I admire your efforts. And I have a book that you made and I can vouch for how beautiful they are! Very pretty! I wish we had classes on bookbinding near us. I’ve never seen a thing.